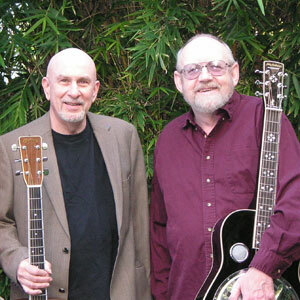 Long-time Freight favorites, Mitch Greenhill and Mayne Smith join two streams of American traditional music "where country meets the blues." Mitch began his career in Harvard Square's coffee houses, focusing on blues and other African American guitar styles. Mayne's home is in the Bay Area, where he developed his spine-tingling Anglo American country-style singing, as well as his dobro and pedal steel guitar technique. They performed together with the acoustic/electric band, The Frontier, and then as sidemen in a honytonk country band in the 1960s and ‘70s. They have also released two albums, Storm Coming (1979) and Back Where We've Never Been (1985). Tonight, Mitch and Mayne celebrate their 40th anniversary as musical partners, revisiting tradition and introducing originals with their trademark tight vocal harmonies and hot licks. As always, they deliver wide-ranging material from sources like Rev. Gary Davis, Roy Acuff, and Thelonius Monk, plus original compositions in a style described by the late great San Francisco Chronicle writer Phil Elwood as "vernacular music, the real American popular music that comes out of the people, out of the performer, not off the printed score or dial spinning record producer."